These are the results of the 79th Annual Academy Awards presentations. Oscar winners are highlighted in bold and marked with an Oscar logo. Films with production notes are linked in blue. 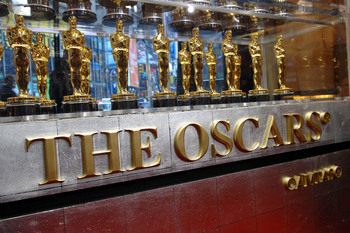 Fifty Oscars, two statuettes that belonged to Hollywood legends, and one statuette for the public to hold are on display at "Meet the Oscars, New York" at Times Square Studios in New York City. The exhibition remains open through Oscar Saturday, February 24, 2007. Photo by Paul Hawthorne. All photographs are Copyright © A.M.P.A.S. except where noted. Credited "Academy of Motion Picture Arts and Sciences" or "A.M.P.A.S." Press Photo Area developed, and hosted by Neuco Image Group Inc.
"Oscar®," "Oscars®," "Academy Awards®," "Academy Award®," "A.M.P.A.S. ®" and "Oscar Night®" are the trademarks, and the ©Oscar® statuette is the registered design mark and copyrighted property, of the Academy of Motion Picture Arts and Sciences. See the Oscar Nominations Updated Live. If you can't watch the Oscars live, bookmark our live list to see the winners updated. See the Oscar Live list Save up to 30% on This Year's Nominees.